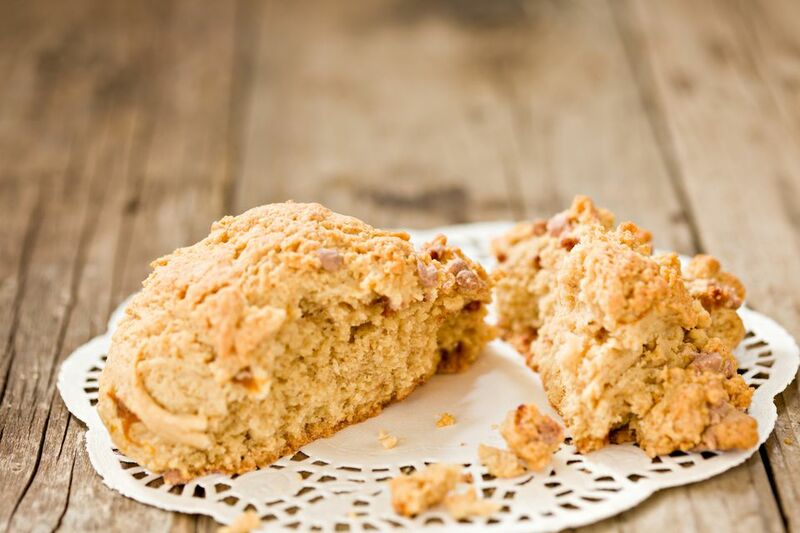 This almond scone recipe is very easy to make if you have any baking experience. If you don't have much baking experience, read these scone-making tips before you start baking these almond scones. Preheat the oven to 400 F. While the oven is preheating, toast the almonds, stirring occasionally until they are lightly browned. In a large mixing bowl, mix the remaining dry ingredients (flour, sugar, baking powder, cinnamon, and salt). Add the almonds, almond extract, and vanilla extract. Do not stir yet. With minimal stirring, mix in just enough buttermilk or heavy cream to make the dough stick together. It will be crumbly and there should still be a little bit of dry flour left in the mixing bowl. Gently pat the dough to one or two 1–inch thick discs. Cut each disc into 6 to 8 pieces. Serve with coffee or afternoon tea and with jam, clotted cream, Devonshire cream or lemon curd.